We now offer Free Shipping on all FightCamp packages. This package has everything you need to get your home gym up and running. All FightCamp packages require a monthly FightCamp Membership. Access unlimited workout content for $39/month. Membership fees billed on full FightCamp Gym delivery. No commitment. Pause or cancel at anytime. If you already have access to good Boxing equipment, this package will get you what you need. Access unlimited workout content for $39/month. Membership fees billed on full FightCamp Connect delivery. Access unlimited workout content for $39/month. Membership fees billed on full FightCamp Family delivery. FightCamp’s Punch Trackers are used by many of the top Fighters in the world. They track and display punch volume, speed and Output in real time. Your trainer will set a minimum punch goal for you to hit every round. You should aim to meet or exceed this goal every round while maximizing your Output. See where you stand compared to others. Unleash the fighter within and aim to out punch the community! See your punch output go up as your technique and conditioning improve and set new goals for yourself. Syncs with iPhone 5s and later, iPad 4th gen. and later with a range up to 50 feet. Built to stand workouts that will leave you dripping with sweat. Tracks your hand motions up to 1000 times per second with a 6-axis inertial motion unit. The Intuitive LED display color code shows you which arm each Punch Tracker belongs to and their Battery status during recharge. Charge your Punch Trackers for 20 minutes and get enough battery for a full 12-round class. Battery life can sustain up to 10 hours of workout activity (full charge time = 60 minutes). The FightCamp free standing bag is the best of its kind. It features a two-part stem designed for maximum shock absorption and a new hook and loop tension lock that attaches the cover of the bag to the base. This is the first free-standing bag that allows you to go all-out without unforgiving bag displacements. The FightCamp Mat outlines the perfect amount of space needed to complete your FightCamp workouts. It provides shock absorption and a high friction surface which keeps the bag from sliding and protects your floor from scuff marks and other potential damage. Made of 8 interlocking tiles that connect together, it can be adjusted to fit your needs. Adjustable 8' by 4' (8 tiles, 2'x2' each). These premium, genuine-leather training gloves marry the protection and function of a pro fight glove with a sleek, designer aesthetic. They are 100% hand-made with strong attention to providing elevated comfort and superior durability. You’ll feel like you slipped your hands into a pair of clouds and you’ll be ready to unleash some thunder and lightning on that bag! The FightCamp Quick Wraps are equipped with a flexible pocket to firmly hold your Punch Trackers in place during your workout. With a wrist wrapping section for additional wrist security as well as a padded knuckle section to protect your hands, you will be ready to start a workout in no time. For iPhones and iPads running iOS 11 or higher. How long does it take for my FightCamp Gym to be delivered? Depending on where you are located in the U.S your FightCamp will be delivered in 5-7 business days. You will receive an automated email with tracking information once your order is shipped. What is your return policy (30-day Money Back Guarantee Policy) ? 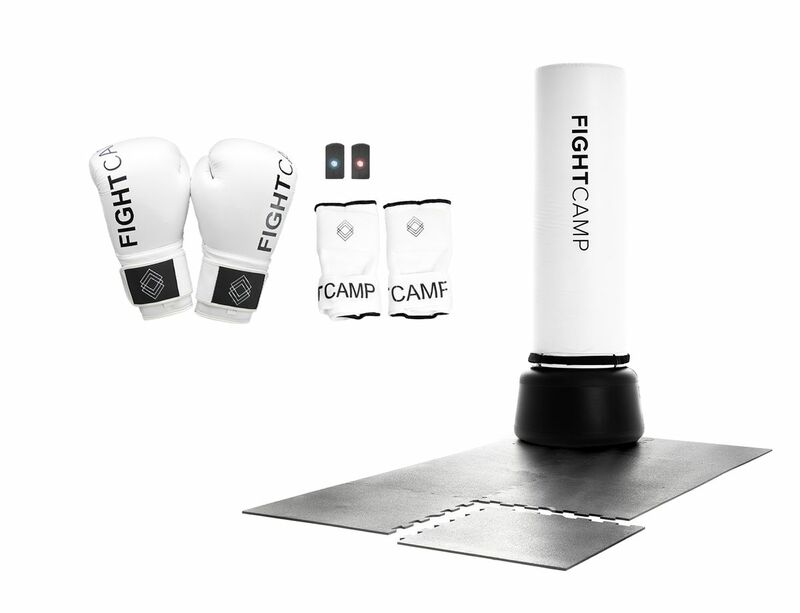 If you are not satisfied with your FightCamp, you can ask for a refund within 30 days of placing your order. Reach out to info@joinfightcamp.com to get started! Because of the size and weight of your FightCamp, we do not offer a refund for shipping charges. A restocking fee may be charged to some items. FightCamp’s guarantee doesn’t cover ordinary wear and tear or damage caused by improper use or accidents. Only items purchased from our online store (joinfightcamp.com) can be returned through this process. How many users can train on my account? FightCamp allows you to create accounts for your entire household so everyone can enjoy the workouts. What is the FightCamp warranty? FightCamp warrants its products against defects in workmanship and materials for a period of 12 months from the date of original delivery, provided they have not been subjected to obvious abuse, neglect or misuse. There is no contract with FightCamp, you can cancel your subscription at anytime by contacting our customer support team and ask to cancel your subscription. What do I need to join FightCamp? You don’t need anything! We will provide you with everything you need to enjoy the full FightCamp experience. Shipping in the US is FREE for all packages including the FightCamp Gym, the FightCamp Connect and FightCamp Family. Please note that we do not ship to Alaska, Hawaii, or outside of the US. Every week, 4+ new FightCamp workouts are added to the library. Feeling like doing a previous workout and improving your score? Don't worry, we're keeping every single workout in our library for you to access anytime. FightCamp is only available for iOS devices at the moment. Please email info@joinfightcamp.com if you’d like to express your need for an Android version of FightCamp.